Last week my family decided we wanted to squeeze in one last vacation before we started school on Monday. We packed our bags and left for Colorado on Tuesday afternoon. We have never gone on vacation just the five of us just for fun before and we thought Colorado would be nice because it isn't a million degrees there like it is in Texas. We left the house around 3 pm and drove to Amarillo. 7 of the 12 hours of our trip were driving through Texas so Tuesday we didn't even make it out of Texas. We stayed the night in a really weird hotel that smelt like dirty diaper and I was totally disgusted. We left the hotel around 8 am and spent the rest of the day driving. When we stepped out of the hotel it was only 70 degrees outside and it wasn't humid at all and I couldn't believe we were still in Texas! When we finally made it to our cabin in Colorado it was already around 4 pm so we all chose our rooms and our parents made a quick grocery store run while we explored. Before dinner I spent my time teaching my brother how to play darts and ping pong. After dinner we spent the rest of the night in the hot tub and once we were wrinkled like old people we went and watched a movie in the home theater. Thursday we were going to tour a museum but once we got there we were told the whole town's power was out. 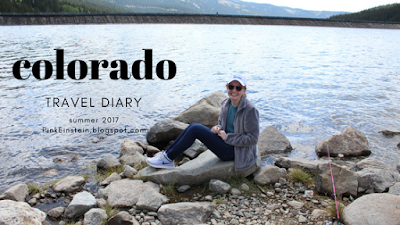 Since the power was out we decided to go to a resort in Breckenridge and we rode a gondola to the top of a mountain where we ate lunch and then rode another gondola up the mountain and slide down the mountain on a huge slide! We decided to leave a day earlier than planned because we wanted to get home before Sunday because our first day of school would be Monday and we didn't want to be exhausted. So we spent the morning fishing. I don't fish so while my family fished I took pictures and relaxed. After fishing we packed up the car and went to the museum we had wanted to go to on Thursday and afterward we went and got lunch at a cute ice cream parlor before heading back to Texas. We finally made it to a hotel in Amarillo around 12 am and we were so exhausted we didn't even bring our suitcases into the hotel we just went straight to our rooms and went to sleep in our clothes. We finally made it home around 2 pm Saturday and it felt so good to be back home and see my dog and my cows.